JUMP hosted a tasting with whisky expert Hajime Kunai, Certified Whisky Expert (Japan Whisky Research Centre) and former General Manager of the Mars Shinshu Distillery, on November 8, 2018. The tasting for JUMP members washeld at Sasakawa USA’s offices in Washington D.C.
JUMP traveled to Hawaii for an event at the Official Residence of the Consul General of Japan in Honolulu on October 15, 2018. 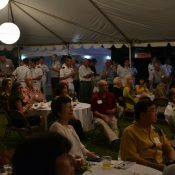 The Japan-America Society of Hawaii, in partnership with the National Association of Japan-America Societies (NAJAS) and Sasakawa USA, hosted a gathering for Japanese military service members aboard the visiting JS Kashima and locally based service and civilian members of the U.S. military who have served in Japan. 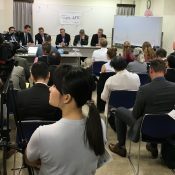 Special thanks to Consul General Koichi Ito and Mrs. Ito for graciously hosting the event at their residence; Peter Kelley, President of NAJAS; and Chris Rodeman, Director of JUMP and Research Fellow at Sasakawa USA for attending and making this event possible. 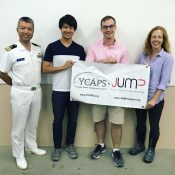 JUMP connects past and present service members, families, and government civilians who have served in Japan. The program provides a powerful foundation for sustaining the solid alliance and relationship that exists between the U.S. and Japan. 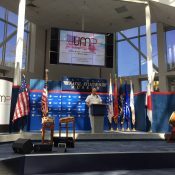 On October 6, JUMP and the Japan-America Society of Northwest Florida co-hosted the 4th Annual Japan-U.S. Military Program event at the National Naval Aviation Museum in Pensacola, Florida. 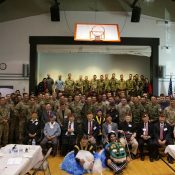 It included reunions by base for U.S. service members who have served in Japan, as well as presentations, bamboo flute and Taiko drum performances, and Japanese food. The event wasfree and open to the public, regardless of military service. 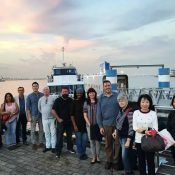 Eleven JUMP and Yokosuka Council on Asia-Pacific Studies (YCAPS) enjoyed a cruise together on September 22, 2018. The event was designed for YCAPS members and associates to see the industrial center of Kawasaki. The group met at 5 p.m. at Yokohama’s Red Brick Warehouses. From there, they they cruised through the industrial heart of Tokyo Bay, enjoying a spectacular display of lights and fireworks in the dark. 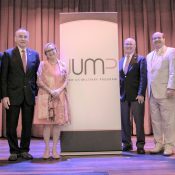 In coordination with the Japan-America Society of the State of Washington and the Nisei Veterans Committee, Sasakawa USA’s Japan-US Military Program (JUMP) hosted an event in Seattle, Washington, on September 9, 2018, from 10 am to 2 pm. Attendees were able to take a tour of the NVC Memorial Hall and hear from Nisei veterans, as well as help welcome guests from the Japanese Self Defense Ground Forces and Joint Base Lewis McChord. A YCAPS-JUMP Seminar, “The U.S., Freedom of Navigation & Indo-Pacific Maritime Security,” took place in Yokosuka on September 4. 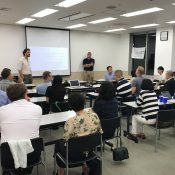 Dr. Giulio Pugliese presented on Japanese foreign policy for a YCAPS-JUMP Seminar on August 9. Sasakawa Peace Foundation USA, the National Association of Japan America Societies, and the Japan Society of New Orleans co-hosted a reception at the National World War II Museum on July 26, 2018. This free event was exclusively for members of the U.S. Army, National Guard, Navy, Marine Corps, Air Force, and Coast Guard, their dependents and spouses, and DOC civilians who have served in Japan at any point in their careers. JUMP held a special event in Tampa on June 28. The Consulate General of Japan in Miami hosted JUMP members for a reception with traditional Japanese food. The Honorable Ken Okaniwa, Consul General of Japan, gave a presentation. Guests also heard speeches by U.S. military members and were treated to a taiko drumming performance.